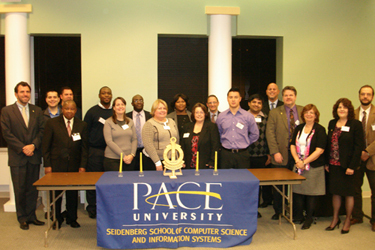 On October 19, 50 outstanding Seidenberg students and one faculty member were inducted into the New York Delta Chapter of Upsilon Pi Epsilon (UPE) at Pace University. In the opening of the induction ceremony, Sotiris Skevoulis, professor of computer science, gave a talk on “Software Engineering: The Road to Rigorous Software Development, Education and Practice”. Every third semester, Seidenberg juniors, seniors, master’s and doctoral students meeting the eligibility requirements and receiving the recommendation of the faculty, are invited to join UPE. The inductees receive a one-year student membership in the Association for Computing Machinery (ACM), a certificate, and a key pin with the UPE insignia. Upsilon Pi Epsilon is the first and only international Honor Society for the Computing and Information Disciplines established to recognize academic excellence and service to the disciplines. The society is endorsed by both the ACM and the IEEE Computer Society. This year’s inductees include: Kirk Anne, Roberto Arcos, Nancy Baker-Jones, Nina Barucco, Jennifer Brola, David Cabrera, Ana Caicedo Escobar, Thomas Callahan, John M. Casarella, Frederick Duffy, Joseph Everett, Newton Fong, Mitchell Fried, Nancy Friedman, Jose Gonzalez, Stephen Gorton, Ursula Heinrich, Marco Hernandez, Linda Holik, Michelle Ifill-Roseau, Lawrence H. Immohr, Alvin James, Cranston Jordan, Ian Kelley, Mohammad Khan, Rachel Klingberg, Michael Kollmer, Linda Kurtz, Amine Lamrabat, John Macal, Joseph R. Massi, Dmitry Nikelshpur, Christopher Nwosisi, Johnathon Pasley, Piyush Patil, Lawrence J. Price, Josua Purba, Cesar Rodriguez, Anthony Rodriguez, Madalyn Romano, Bruno Scap, Samir Shah, Sotiris Skevoulis, Dmitry Sharlot, Carolyn Sher DeCusatis, John Stewart, Hang Su, Yuriy Tanskiy, Lynda Vincent, Robert S. Zack, Miguel Zhindon. The Seidenberg School wishes Katie Todd a Happy Birthday!